Please click the link below to jump to the latest version. Choosing to disable hserin and hserout at the same time causes the wizard to produce 'hsersetup off' in the command box and hides the baud settings, actual baud rate and error since those become irrelevant. 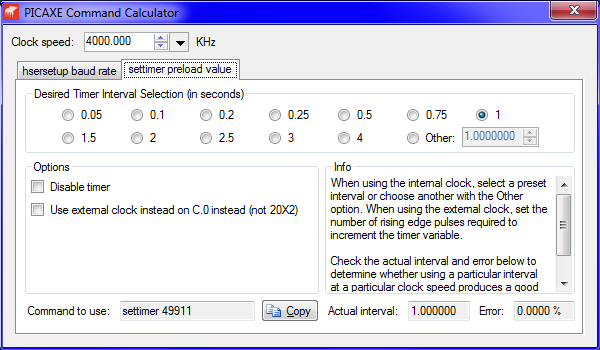 When the external clock is selected, the interval selection is replaced with somewhere to specify how many pulses are required to increment the timer variable. The attachment is a zip containing an exe, rather than a renamed exe. 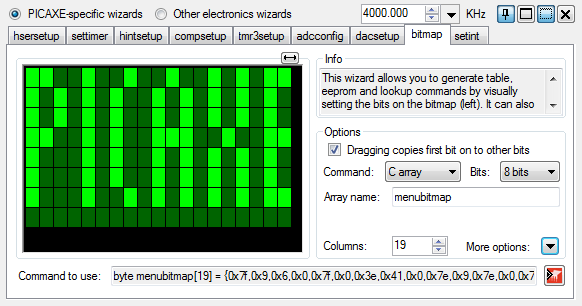 The 'PICAXE Calculator' zip file contains the program and the sourcex.y.z folders contain the VB.NET source code including form code, form designer file, icons, bitmaps, project file and solution file. To see how each command is calculated, see the source code for the latest version. Comments, suggestions for improvements and extra calculators, and nitpicking are all welcome. Licensing: Free for any use, but attribution required for reuse of original code. Latest version at the end of this thread - the version below is the first version. I think such wizards would be a very useful addition, though they should probably be under an "advanced" tab to not confuse the newbies. Calculating pre-load values for obscure intervals is certainly a chore I find myself doing frequently and often get wrong. Having the ability to put in ACTUAL clock speed and calculating error from desired would be a real bonus. This might be better off in the Editor Wishlist thread. Is this about a desired function in P.E. or in my program? 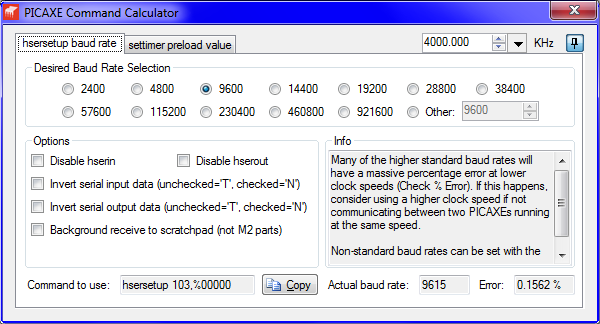 In my program you can just type any frequency to the nearest 1Hz in the clock speed control and select the 'Other' radio button to enable selection of any interval for the timer. Can you move it there please? I'm also releasing the source code. Again, comments etc. are welcome and the application and source code are attached. Comparators wizard (with interactive schematic where you can click the switches to toggle them. Tabs now only show names of commands themselves since each wizard calculates the entire command. 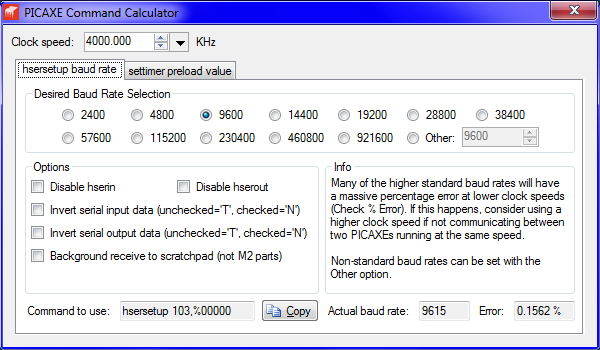 Maximum allowed baud rate for hsersetup is now halved after reading Technical's statement of a hsersetup baud_value of zero turns hsersetup off. 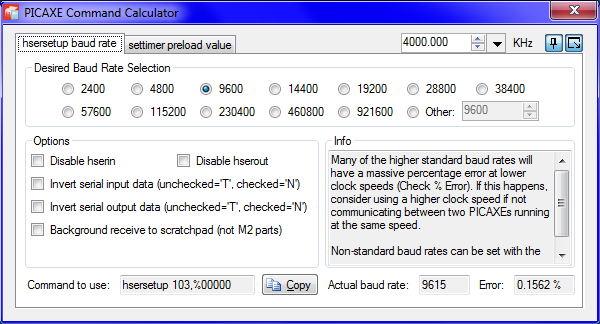 I should have noticed before since with the PIC's clock divider taken into account, it would have been impossible to have a baud rate of one million when the UART could only toggle pin state 500,000 times a second with a 4MHz resonator. The new version is attached. I'll attach the source code tomorrow. If any of the wizards produce incorrect commands, please reply saying so. Why doesn't the MacAxEPad SW get all the cool wizards??? Red crosses appear on top of disabled comparators to make it clearer which ones have been disabled. @IronJungle - Take a look here. Of course another reason why software isn't developed for Mac as much could be because not many people have them since the entry level Mac costs over twice as much as an entry level PC. About half of the time, you can get Windows for free legally since Microsoft release betas and release candidates of Windows before they release them. So you could download the Windows 8 Developer Preview and install it in bootcamp or whatever. I guess someone has to spent the time and effort, for free, to convert them ? Are the wizards written by non Rev-Ed humans and added as a plug in? I thought the wizards were compiled into the official Re-Ed software releases. These 'extra wizards' are a stand alone software and can run alongside PE. [HR][/HR]And yes, the wizards are definately standalone and have no dependencies on Programming Editor at all, all that is required is that .NET Framework 2.0 is installed. Although it would be nice if I could program it to insert the generated code into Programming Editor. I don't think I've mentioned yet that the source code is for Visual Basic 2008 and might not work in Visual Basic 2005 or older versions. Visual Basic 2010 (and later versions too later this year) might show a conversion wizard and following that should be fine. Visual Basic is quite an easy language to follow so anyone's free to convert it into a programming language for a non-Windows operating system. There might even be a Visual basic compiler for Mac and Linux! Only two items in total are on the lists this time but they are major. 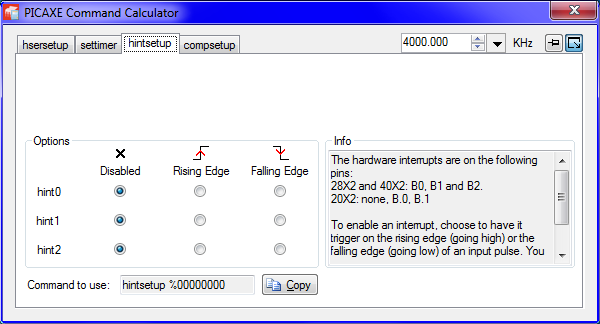 Copy to clipboard buttons replaced with Insert into PICAXE Editor button which is compatible with PICAXE Programming Editor, AXEPAD and my own rubbish editor. Since it just inserts text into the first window with its title containing "Programming Editor", "AXEpad" or "AXElite" (checked in that order) it might select the wrong window if there is another window open containg that title. Suggestions for extra wizards are welcome since I'm running out of ideas for new wizards now. External reference pins in adcconfig wizard now renamed "Vref+" and "Vref-"
Lots of good work there, Nick. Thank you for taking the time to do it and release it. This is just a minor update to fix an issue I've noticed - if the PICAXE clock speed is set above that required for a one second interval to be selectable for the timer wizard, an error will be shown on startup. The default selected timer interval is now 0.1. What a great idea. Brilliant. Thanks Nick. Thank you for the complements. But don't be afraid to nitpick or just offer some suggestions. how come, when I click the wizard, a red dialog box appears: "Reformatting Hard Drive" ?? Just kidding This is a GREAT wizard! Thanks for sharing. 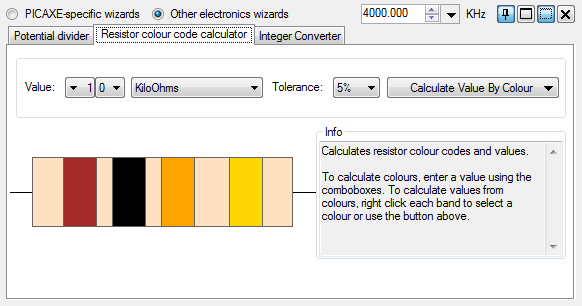 R1, R2, Vout and Vin are NumericUpDown controls with decimals enabled. I suspect the issue might be that the code gets stuck in an endless cycle of executing the CalculateVout sub since another value changes but I'd expect that just to freeze the application rather than causing a crash - "Sorry but this program has encountered a problem and has to close"
I am sure that this is what happened then. Please report any incorrect calculations. So that's voltage divider, ADC and voltage reference (sort of) done. BCD and binary - I'll start work on those. Nick, the wizard worked just great for me with some known values. Nothing locked up or reset. The thing that I see you could add is the multiplier(s) needed to get the ADC value back into human readable form with the decimal precision wanted. For example, we use 15Vin, 30K/10K divider making 3.75Vout. 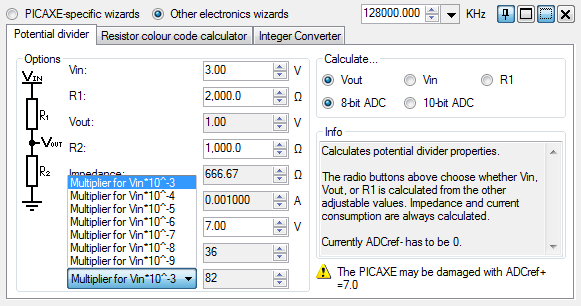 This is an ADC value of 767 with the 5V reference. 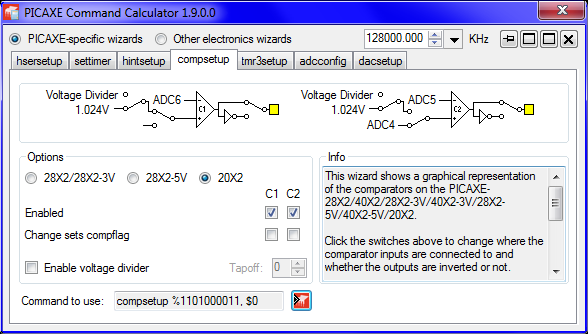 What multiplier(s) does it take to recreate the "15V" from the ADC value of 767 with one or two decimal places? Then we would have to break that number into pre-decimal and post-decimal parts to send it to a display. You are doing great so far. You've go a winner of a program now. One thing that I did notice is that the "Insert ... into Editor" doesn't quite function. The first time I used it, it inserted about half of the "Command to use:". The issue was that Windows XP uses a small delay (which is human noticeable if you watch carefully) when switching between windows using the code AND it allows the following code to execute before the window switch completes but Windows 7 does not have this delay so whilst it would work fine on Windows 7, on Windows XP the application would sometimes send the text to itself instead of Programming Editor. The fix was to use a timer set to a short delay to allow for the window switch to complete and now it works fine on Windows XP on a Dothan-core Pentium M. If problems still persist, say so and I'll increase the time delay (currently 50ms). I might have to eventually stick on an options tab where this delay can be changed. Your request should be simple as all I need to do is derive the formula it's even simpler than that. I might be able to get the update completed by today. Note: When closing and starting the program in no borders mode, the window border will briefly flash on. I had to have it so that this was done as if I just saved the position as it was without restoring the border, when the program was next run the settings would not be applied properly (yes, I did put the border/no border code before the location code and that did not fix it). I noticed that I had changed the layout of some of the tabs by accident. Problem fixed now. 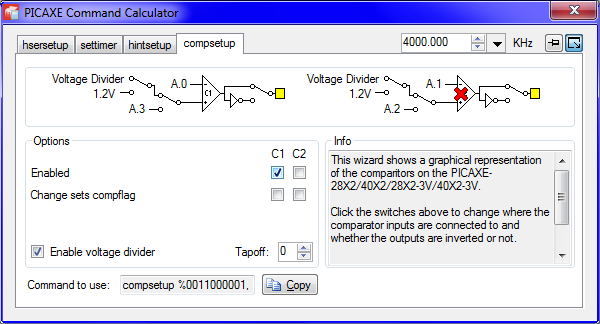 Nick, your "multiplier" calculation changes with the "Vin" voltage change. The multiplier should be a fixed number for changes in Vin, but I see your dilemma. To make this more useful, there should be a multiplier for tenths and hundredths also. Now that you've added the multiplier, there is still value in having the calculations done with a value of zero for "R1." This is the simplest case for testing the battery voltage, although using "calibadc" is possible, too. I forgot to add that there is a visual need to have 3 decimal places in the "ADCref+" field. 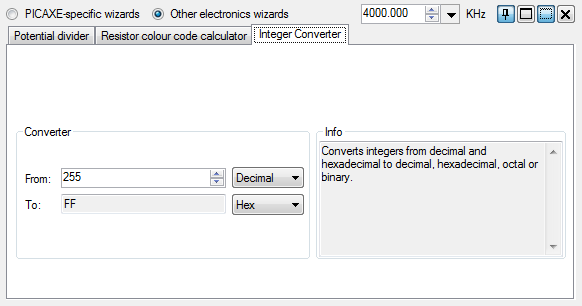 This probably happens because the ADC value numericupdown actually stores a decimal and when this is put back into the calculation for the multiplier, it would produce a different result from just putting an integer value of ADC Value in to a calculator so I put in integer conversion without fully testing it afterwards. I will take out the integer conversion. I chose to do thousandths because this gives a reasonable level of accuracy on the PICAXE which can't do decimals. Or do you mean tenths and hundreds of mV? In that case, that would be a sensible addition. I'll look at the code later. Calculation of values when R1 is 0 probably doesn't happen because of a division by 0 error. This will require more thought on your part. You may have to present the multiplier as a multiply and divide combination to make it useful. I see the point about the divide by zero problem, and it certainly does apply in the context of a ratiometric voltage division calculator. 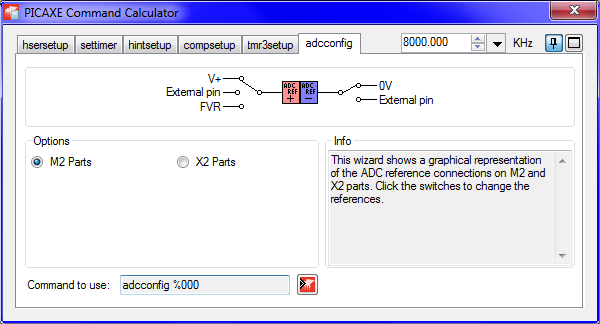 I suppose the ADC multiplier to real-world numbers is really a function related more to the ADC than the voltage divider. I will change to multiplier magnitude selection rather than decimal places when I have more time to do this. 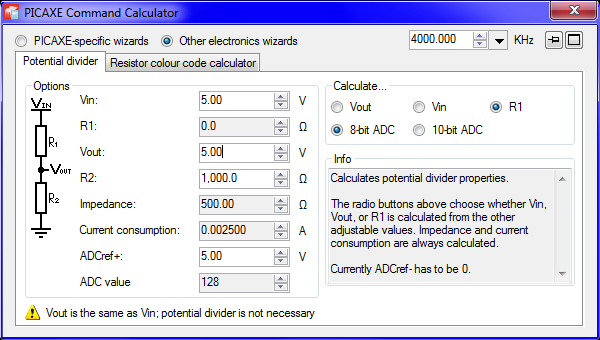 ADC Multiplier for Vin calculation now uses a combobox for selection of Vin "powers". I'm finding the calculator very useful, it's a great piece of work. One thing it needs is it's version number somewhere on show. This should not be too difficult to implement. Easy - I'll just stick it in the title bar. As, like the text "PICAXE Command Calculator", you don't need to see this all the time, I don't think it really needs its own dedicated label on the form but say so if you think different. 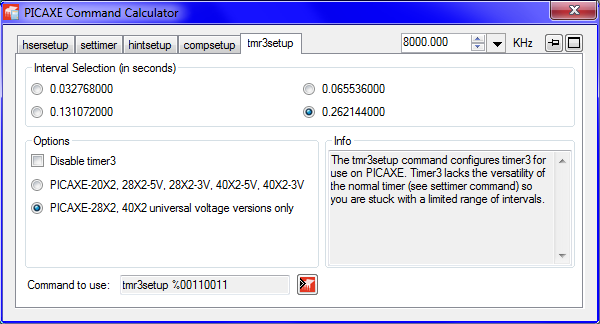 Compsetup command now supports all PICAXEs which support the command rather than just 28X2/40X2/28X2-3V/40X2-3V. Please confirm that everything works OK, and keep the suggestions coming. Nick, the multiplier function in the potential divider section is really not right, if not wrong. I don't know how to explain any further. And how is it not right? It uses integers now so what else is wrong? Yes, that's it. A label being moved by one pixel. Things like labels being out by a pixel does irritate me. @TexasClodHopper - Yes you do need to explain further or at least recap me on what you wanted and how the previous update failed to deliver this so that I can make the application better. My little "checkBattery" routine operates off of a voltage divider of 1/4th (30K in series with 10K). 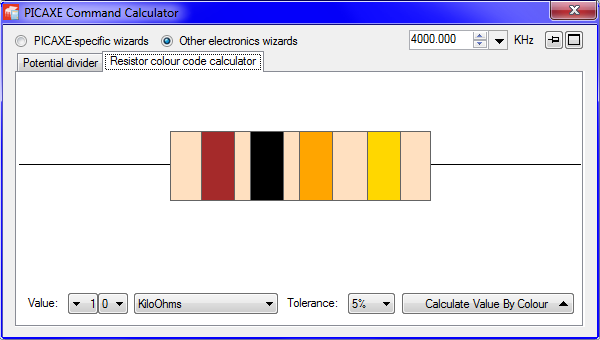 A voltage of 15VDC is divided down to 3.75VDC. I used 1% resistors. 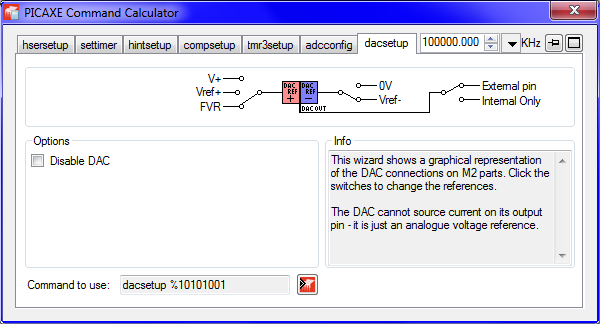 I used the 4.096VDC reference (fvrsetup FVR4096 with adcconfig %011). I used a word variable for "adcBatteryreading", "batteryVoltage" and "batteryLow" are byte variables and "BATVOLTMIN" is a constant. What more can I say? I've finished version 1 of my project and am starting to optimize the design for version 2. Perhaps you can be famous and come up with a total solution. 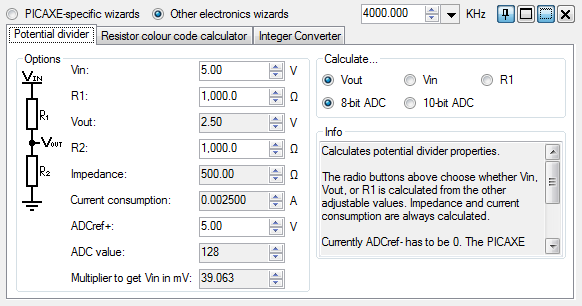 batteryVoltage = adcBatteryreading * 40 / 236 ' adjusted from 273 to read correctly at 12.0 v.